What was the route the Titanic took on her maiden voyage? This article illustrates the route the Titanic took on her maiden voyage. As we all know, the RMS Titanic never completed her maiden voyage. On the night of April 14th, she struck an iceberg at 11:40 PM apparent time ship (ATS), and sank just 2 hour and 40 minutes later. However, one of the questions that seem to come up is where was the Titanic on each of the first three days out since leaving Queenstown? To answer this question we can make use of the daily reported mileage runs for the first three days and the planned route of travel. Total distance run from departure at Daunt’s Rock at 2:20 PM GMT April 11th to local apparent noon April 14th was 1549 nautical miles. By using the distance traveled per day along the known route of travel we can derive an estimate for the position of the ship at local apparent noon (LAN) each day for April 12, 13, and 14. The actual route taken was a series of rhumb line tracks along the Great Circle. But it is only the end point of each travel day taken at noon that we are most interested in. For the first day we need to consider the route taken from the Daunt’s Rock light vessel to Fastnet light, and then add the segment along the Great Circle track from Fastnet to local apparent noon on April 12th. 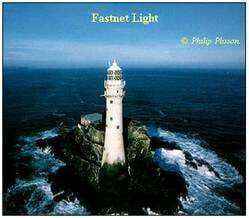 The route from Daunt’s Rock to Fastnet consisted of two segments. The first was from the Daunt’s Rock light vessel to a turning point off the Old Head of Kinsale Lighthouse, a distance of about 14 nautical miles. The complete route of travel along the southern Irish coast is shown in the figure below. The total distance taken along this route comes out to be about 55 nautical miles. This distance is then subtracted from the reported distance of the first day’s run to give 484 – 55 = 429 nautical miles, the distance from Fastnet to the noon position for April 12. This noontime position falls on a rhumb line from Fastnet light to an apparent alter course position for 7:00 PM GMT that was sent in a wireless message from the Titanic to the La Touraine that very day.15 The distance between the position at noon and the position sent in the La Touraine message works out to be about 114 nautical miles. To go from this 7:00 PM GMT position on April 12th to the noontime position for April 13th we have to travel over a distance of about 405 nautical miles to a point on the great circle track. This is because the run between noon April 12 to noon April 13 was reported as 519 miles, and the alter course point for 7:00 PM GMT on April 12th was already about 114 miles beyond the noontime position. To get to the noontime position for April 14th we have to travel a distance of 546 miles from the noontime position of April 13th to a point on a line of bearing of 060.6° true from a fixed point in the Atlantic called the Corner.16 This corner point, the end of the great circle track at 42° N, 47° W, was the turning point for all westbound ships heading for the east coast of North America that time of the year. The result is a total of 429 + 519 + 546 = 1494 miles from Fastnet to local apparent noon for April 14 over the traveled route. A noontime location that was only 126 miles from the Corner. The following table shows the actual distances that were worked out between key points along the route of travel for the derived coordinates as well as the rhumb line course angles rounded to the nearest degree. The following table show the total clock adjustments for the first three days out from Queenstown. In summary, we have derived the most likely locations of the Titanic at local apparent noon on each of the first three days out from Queenstown. These were obtained from the reported distances made good and planned route of travel. We also were able to derive the time in GMT of local apparent noon for each of those days, and the amount of time the clocks were set back each night. We also derived the average speed made good over ground for each of those three days of travel. 1 In 1880 the legal time for Great Britain was made Greenwich Mean Time (GMT) by Act of Parliament. In the same act the legal time for all of Ireland was made Dublin Mean Time (DMT) and was not changed till 1916 to be the same as GMT. Dublin is at longitude 6° 15' W, which meant that DMT was 25 minutes behind GMT. [For a more detailed history of events up to this point, see Derek Howse, Greenwich Time and the Longitude (National Maritime Museum / Philip Wilson Publishers, 1997).] However, according to the rules and regulations of the International Mercantile Marine Company (owners of the White Star Line) that were in effect in 1912, departure and arrival times when entering or leaving English or Irish waters were always to be recorded in GMT. Once out to sea, time was kept according to where the ship would be at local apparent noon, the instant of time when the true sun would reach its highest point in the sky. Time being kept this way was known as Apparent Time Ship or ATS. When arriving or departing points in the United States or Canada, ship’s time would be changed to the mean time for the 75th meridian of longitude which was exactly 5 hours behind GMT. 2 A Great Circle track is the path you would get if you took a tightly stretched string and used it to connect any two points on a globe. It is the shortest distance that connects those two points. 3 A rhumb line track is the path that you would get by following a fixed compass direction without change. If the compass direction you followed was due north or due south, you would also be following a great circle track on one of the earth’s meridians. You would also be on a great circle track if you happened to be on the earth’s equator and went due east or due west. Any other direction to the north or south of due east or due west will eventually spiral in toward one of the earth’s poles. 4 This route was known as the southern track taken by steamers heading westbound across the Atlantic leaving Queenstown. It was in effect from January 15th through August 23rd. The point called “the corner” marked the end of the great circle part of the westbound voyage. Eastbound steamers on the southern track would reach a corner point 60 nautical miles to the south of the westbound corner point before they would take to the great circle part of their eastbound voyage. From August 24th through January 14th these routes were shifted northward by about 120 nautical miles, and were know as the northern track. A voyage taken on the northern track made the passage across the Atlantic about 110 nautical miles shorter. After the Titanic disaster the southern tracks were shifted further southward. 5 The Daunt’s Rock light vessel was located at 51° 43’ N, 08° 16’ W from 1905-1938. (Ref: “A Directory of Hydrographic and Atmospheric Datasets for the North East Atlantic and UK Shelf Seas,” Science Series Tech. Report No. 113, Centre for Environmental, Fisheries and Aquaculture Science, 2001, App. 1 – MAFF Coastal Sea Temperature Stations.) The location of the rock itself is at 51° 43’ 30’’ N, 08° 17’ 30’’ W (Ref: www.traveljournals.net). 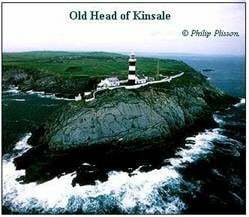 6 We take the turning point to be about 3.3 miles south of the Old Head of Kinsale lighthouse. The lighthouse itself is located on the coast at 51°36.3' N, 8°31.9' W (Ref: The Commissioners of Irish Lights at www.cil.ie). 7 Fastnet lighthouse itself is precisely located on a rock island at 51º 23.3’ N, 09º 36.1’ W (Ref: The Commissioners of Irish Lights at www.cil.ie). 8 Following the Olympic’s second voyage of 1911, we will take this point to be about 2 miles south of the Nantucket Shoals light vessel. The light vessel itself was listed in the US Coast Pilot Part III for 1912 at 40° 37’ 05’’ N, 69° 36’ 33’’ W.
9 The Ambrose Channel light vessel was listed in the US Coast Pilot Part IV for 1909 at 40° 28’ 02’’ N, 73° 50’ 01’’ W. Before passing Ambrose the ship would also pass the Fire Island light vessel located at 40° 28’ 40’’ N, 73° 11’ 26’’ W. But it was the Ambrose Channel light vessel that marked the end of the Atlantic crossing and entrance to lower NY harbor. 11 Confirmation of the run for Day 1 of 484 miles comes from testimony of J. Bruce Ismay. 12 Confirmation of the run for Day 2 of 519 miles comes from Ismay and 2nd class passenger Lawrence Beesely. In his book, The Loss of the SS Titanic, Beesley wrote that the purser had mentioned to him that the 519 mile run for day 2 was a disappointment. 13 Confirmation of the run for Day 3 of 546 miles comes from Ismay, and passengers Lawrence Beesley, Henry Stengel and Archibald Gracie. 14 Photographs of the Old Head of Kinsale and Fastnet lighthouses presented in this article are by permission of Philip Plisson (www.plisson.com). 15 Although the course of the ship was usually set at noon each day, it appears that the Titanic’s course was changed about 5 hours 36 minutes past LAN (which was at 1:24 PM GMT) on the 12th of April. This 7:00 PM GMT position, which was transmitted from the Titanic to the La Touraine at 7:45 PM GMT, is about 6 miles north of the great circle track at the reported longitude. It is interesting to note that in the log of Olympic’s second voyage to New York (in July 1911), the last two out of three noontime positions along the great circle part of her route were 10 and 8 miles to the north of the great circle track line, respectively. Additionally, the first noontime position for the part of Olympic’s route from the Corner to the Nantucket Shoals light vessel was 6 miles to the north of the rhumb line track that she was to be on. 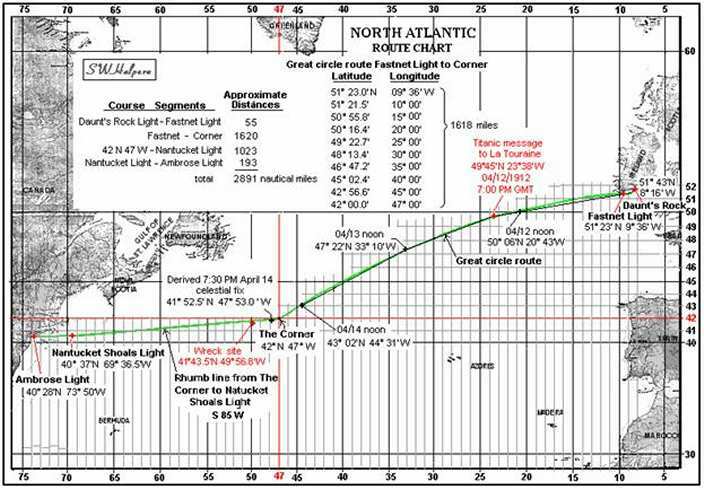 16 From testimony given by the Titanic’s 5th Officer Harold Lowe (American Inquiry, p. 381), the course from noon to the corner was 240.6° true, and the distance was 126 nautical miles (after correcting what appears to be a transposition error of two digits in the transcript of his testimony). Working back from the Corner at 42° N, 47° W, and going 126 nautical miles along the reciprocal heading (060.6° true) gets us to a noon position of 43° 02’ N, 44° 31’ W. This position is a total distance run of 1549 miles from Daunt’s Rock over the course that was traveled. 17 Since the Earth makes one complete rotation with respect to the sun in 24 hours, and since there are 360 degrees in a complete rotation, each 15 degree change in longitude corresponds to an hour change in time. Traveling westward, for example, you would need to reset your clock back by 1 hour for every 15 degree change in longitude that you make. However, this 24 hour day that we are all so used to is measured with respect to a fictitious sun called the mean sun. The earth’s rotation with respect to the true sun, also called the apparent sun, is not exactly 24 hours. This difference arises from two separate causes. The first is that the plane of the equator is not the same as the plane of the earth's orbit around the sun, but is offset from it by the angle of obliquity, the tilt of the earth’s poles. The second is that the orbit of the earth around the sun is an ellipse and not a circle, and the apparent motion of the sun is not exactly equal throughout the year but appears to be moving fastest when the earth is closest to the sun. Even standing on the prime meridian at Greenwich, this difference can cause the true sun to be overhead several minutes before or several minutes after the clock strikes 12:00 PM GMT, depending on the time of the year. This difference is what is called the Equation of Time and must be added or subtracted from the mean time when calculating local apparent noon for any point on the surface of the earth. 18 Rhumb line distances shown here are based on a mid-latitude calculation method for a spherical earth. One minute of arc in latitude is equal to one nautical mile. 19 Rounded off to the nearest degree. 20 Samuel Halpern, “A Minute of Time,” THS Commutator, Vol. 29, No. 171 and 172, 2005. 21 Although the clocks were adjusted the night before to read 12:00 for local apparent noon the next day, a minor adjustment up to a minute if needed was made in the forenoon when they obtained a more accurate longitude for their noontime position (American Inquiry, p. 294.) If the Titanic’s clocks were adjusted back by 25 minutes the night before her arrival at Queenstown to Dublin Mean Time (which was kept throughout Ireland in 1912) as some people have suggested, then the total clock setback (including adjustment in the forenoon) for the first day out from Queenstown would have been 59 minutes. There is some indirect evidence that suggests that the clocks might have been set back about 58 minutes at midnight during the first night’s run since departing Queenstown as this number appeared in a memorandum prepared and submitted by 3rd Officer Pitman to the American Inquiry (pp. 420-421). That memorandum had in it the distances run for each day and the departure time at Daunt’s Rock. As pointed out before, departure times in English and Irish waters were always recorded in GMT by White Star Line rules. A 2:20 PM GMT departure can also be check against the speed she was making carrying 70 revolutions per minute. Other setback times in that memo, however, can be shown to be completely unreliable, and cannot be verified by any other available evidence. 22 American Inquiry, page 451. 23 American Inquiry, page 294. 24 The time interval from LAN one day to LAN the next day is just 24 hours plus the amount of time the clocks were set back. This hold for all days except the first day out. Because they took departure in the afternoon at 2:20 PM GMT off the Daunt’s Rock light vessel, the time of the first day’s run is 24 hours minus the difference between their departure time in GMT on April 11 and the time of LAN in GMT on April 12. That difference was 2:20 – 1:24 = 0:56. Therefore 56 minutes from 24 hours leaves 23 hours and 4 minutes, the time interval from departure at the Daunt’s Rock light vessel on April 11 to local apparent noon on April 12. 25 Speed over ground is not the same as speed through the water. Ground speed is the vector addition of speed through the water plus the net affect of current and wind. 26 American Inquiry, page 3. 28 Samuel Halpern, “A Minute of Time,” THS Commutator, Vol. 29, No. 171 and 172, 2005.